Widen your child's understanding beyond his own family to include all of God's children worldwide! This hands-on course takes you and your child on a step-by-step exploration of the geography, climate, animals, landmarks, and saints of each of the seven continents. 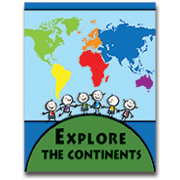 Explore the Continents centers around the creation of colorful poster displays which engage the child's interest and pull together the many facts he is learning about each continent. Over 250 full-color images! 133 pgs. 8½"x11" Loose-leaf drilled, shrink-wrapped. Pages are not reproducible; each student will need his own student course. Recommended core text in CHC Lesson Plans for Second Grade. Tour this title in the Second Grade Interactive Guide!